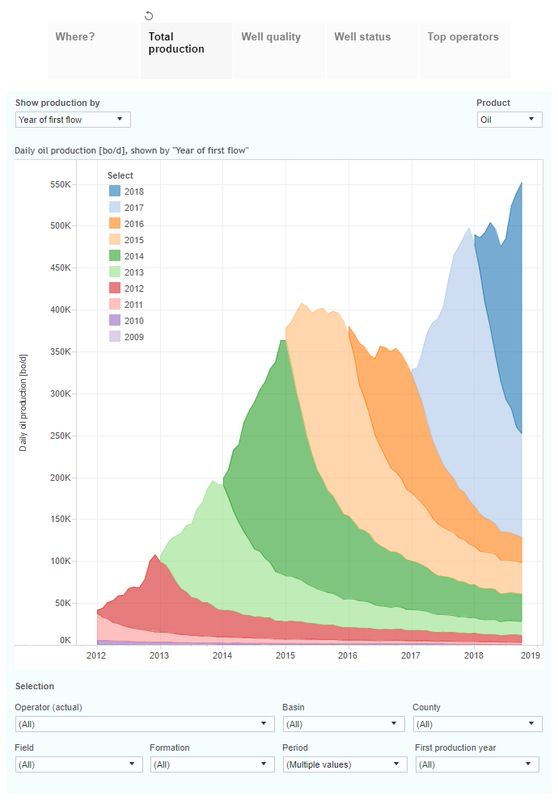 These interactive presentations contain the latest oil & gas production data, from all 9,508 horizontal wells that started production in Colorado and Wyoming since 2009/2010, through October. Oil production in these 2 states set a new high in October, at just over 550 thousand bo/d. Gas production also came in at a record level, at close to 3 Bcf/d. The year over year growth rate dropped however, compared with the previous year, despite that more wells were completed in the first 10 months of 2018 vs 2017. 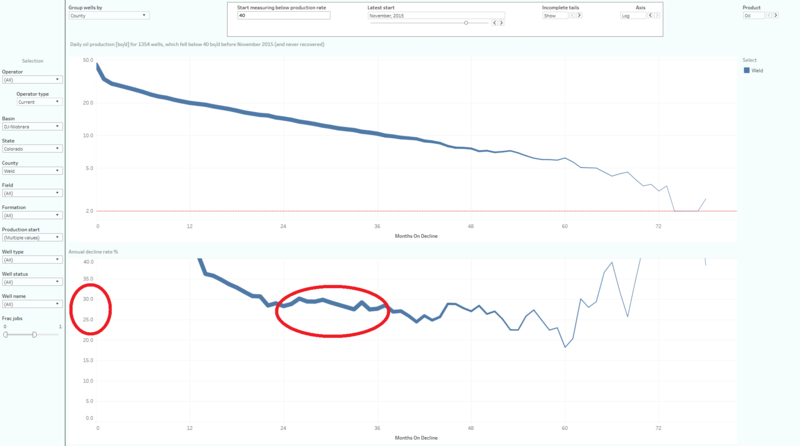 More wells were needed to offset the decline from wells that came online in 2017, and well productivity also fell a little, based on preliminary data (see the ‘Well quality’ tab). The DUC count has remained steady in the past year, as you’ll see in the ‘Well status’ dashboard if you only select the DUCs (using the well status selection on the top). Anadarko, the largest producer in this area, showed a drop in production in the previous 12 months. The numbers 2 to 4 (Noble Energy, Extraction Oil & Gas, and PDC) did break their previous records in October. 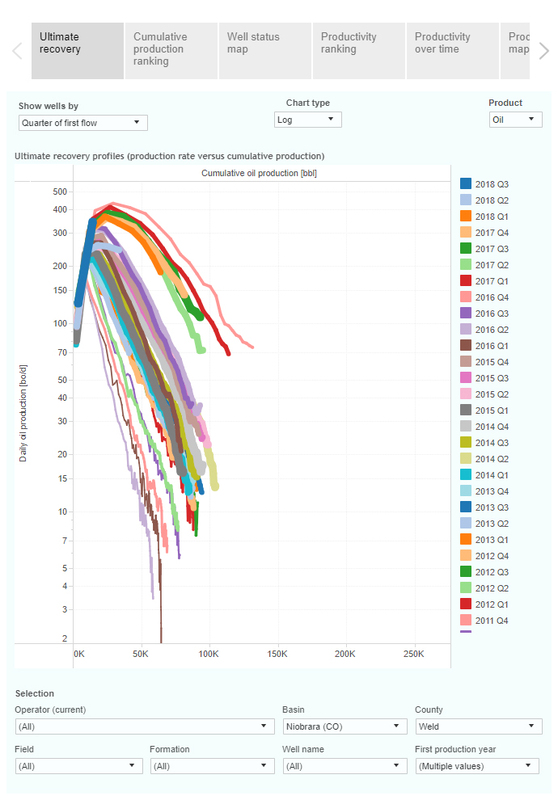 In this “Ultimate Recovery” graph, the average cumulative production is plotted against the production rate. Wells are grouped by the quarter in which production started. This time I only selected Weld County (using the ‘County’ filter at the bottom), as it is good for almost 80% of total production, and I wanted to highlight some interesting things happening here. The first observation is that well productivity appears to have fallen since 2016 Q4/2017 Q1, as wells from later quarters are trending towards slightly lower ultimate recoveries. The second, and probably more important one, is about the terminal decline rates that you can see here. As you follow these curves from wells that started between 2011 and 2015, you’ll see that they start to accelerate downward as lower production levels are reached. You’ll see the same effect if you select the natural gas stream from these wells (‘Product’ selection). That doesn’t bode well for long-term recovery estimates. So how big are these terminal decline rates actually? We’ve just added a new dashboard in our Professional Analytics service, which aims to answer these kind of questions. 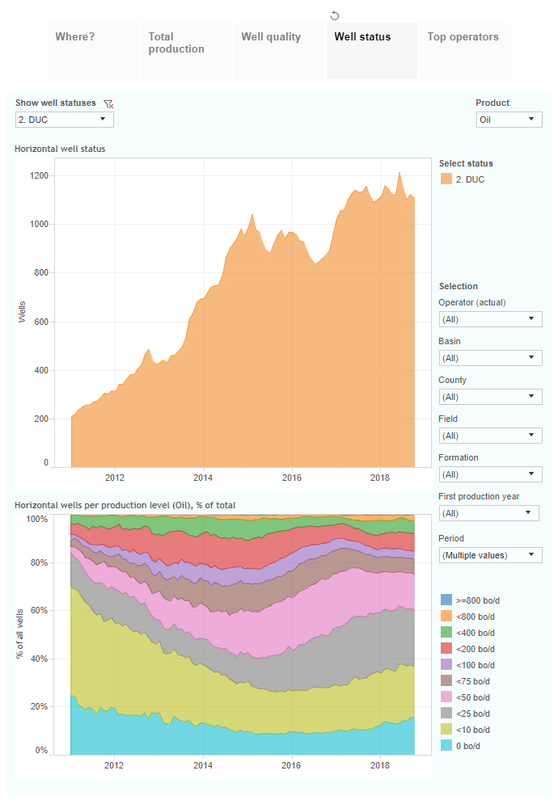 Here you will see a screenshot of this dashboard, in which all the horizontal wells in Weld County are selected, that started production since 2012. Only wells are selected that fell below a production rate of 40 bo/d, from which they never fully recovered, before November 2015. You can see 2 graphs here. The one on the top shows the average flow rate of all the 1,354 horizontal wells that met these criteria, versus time (the number of months after they fell below 40 bo/d). 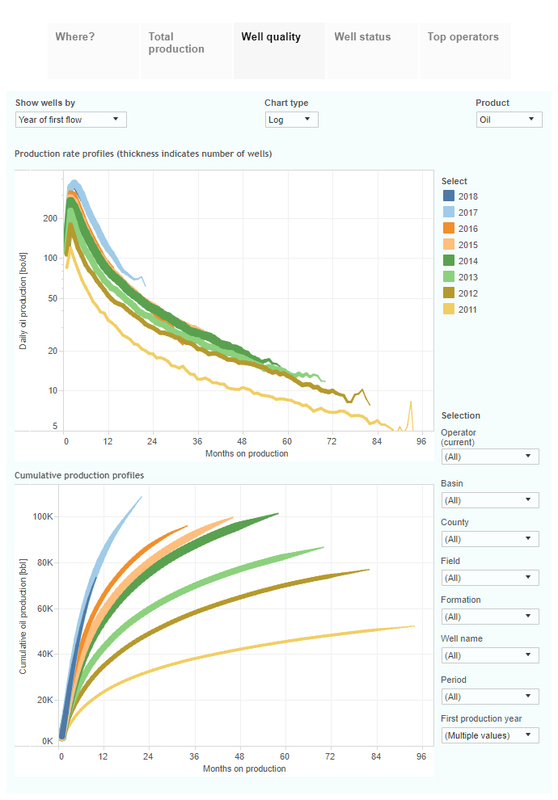 The graph on the bottom plots the average terminal decline rate of all these wells. I recommend ignoring the results up to month 20 or so, due to the inherent bias of this selection. However, you can see that a relatively steady state has been reached after 24 months. Between 24 months, and 36 months, which contains data for all these wells, you will find an average annual decline rate between 25 and 30%. This, I believe, is a far higher terminal decline rate than is commonly assumed when making ultimate recovery estimates. In this dashboard, you will have many more options. For example, you can look at all the other shale basins, or at the terminal decline rate of the gas streams, or group these wells by e.g. the year in which they started to see how these terminal decline rates have changed with newer completions. Other basins didn’t show the same high terminal decline rate, but also there they were significant. Next week we will have updates on the Eagle Ford, and also the Permian if new data for New Mexico has been released by then.